As you all know, I went on a 10 day trip to Hong Kong with my University as a part of a student programme. For this trip, I went with the intention of visiting not only Hong Kong itself, but also to look at and experience film studios and sets for Chinese TV and Cinema. I also had the opportunity to go see some films at the Hong Kong International Film Festival such as Ten Years and Trivisa. Honestly though, despite being a film student... I didn't see that many films, because I'm actually really into the production and creation of film, rather than the finished product itself. Still, it was great to see what I saw, and to be given this opportunity. There were so many beautiful things to see in Hong Kong, like the temples and gardens. Of curse the cities aren't the prettiest of places, due to large buildings and overly crowded side walks, but honestly, I enjoyed every aspect of it (okay... maybe not the crowds), and found the adventure I took exhilarating and enjoyable. I liked what I saw, and I am extremely grateful for the opportunity I was given. There was so much beauty to be found, and oh my gosh, it made me so happy to see such wonderful things! Lee Tung Avenue was quite close to where I was staying, and I loved walking through it at night; absolutely stunning! I was also so so lucky to get to go to the Hong Kong Film Archive and see how they restored old films, with their earliest restoration being a film from 1927. It was so awesome to see how they made these films look better after saving the film reels and cleaning them up, or saving them from mold. Of course, as we found out, not all old films can be saved, given their condition... but it was still great to hear about how they cared for and preserved the films (some reside on a mountain because of how cold the temperatures are, so that the films don't burst into flames. It happened in the old days, what with film bases being made primarily of nitrate back then) and the hours and dedication undertaken to ultimately make them more watchable. Honestly, it's things like this that makes me love and respect film more and more; I feel so privileged to have entered such an awesome place and seen all I could see! I also got to attend the opening gala for the Hong Kong International Film Festival at the Cultural Centre in Tsim Sha Tsui. I got to explore the town a bit, too! It was so beautiful to see Hong Kong Island from all the way across the waters at night! That said, it was just as beautiful to see in the day time, too! The gala was great too, by the way! I got to see so many people in wonderful outfits, and to hear a few speeches from directors on their up-coming works and pieces that would be featured at the festival. Also... there was a giant plastic cake for the festivals 40th Birthday! Yaaay!!! Wewere also given the opportunity to have a look at TVB studios and their indoor and outdoor sets! Some parts we were not allowed to take pictures of, for specific reasons, however old sets such as the outside ones and Studio 1, we were allowed to have at it with the cameras and phones! Seriously though, I adored all of these sets, because they were so beautiful and authentic! I felt like I was in a dream! Everything was gorgeous (despite the rain) and I loved how I felt like I was in another world from my own thanks to these sets. Plus, it was so colourful and bright, and historical in some parts! I think this is an experience I will never forget, seriously! I am super grateful I was able to experience this! Oh, I also got to go to Victoria Peak! It was honestly super gorgeous, but... I wouldn't do it again. I say that because I feel like it's not worth the money you pay to wait so long in a line, only to go through a mall to get to the top and spend about 10 minutes there admiring how high you are. That said, not everyone is like me; stays put for a few minutes then wants to leave. Some people love staying there, but with the crowds and how busy it was - plus how long it too to get back on the tram due to the crazy lines - I wouldn't do it again. Glad I did it once though, at least, because seriously, it's gorgeous! And, on a rare sunny day in Hong Kong (seriously, March's HK weather is like England's weather: RAINY!!!) 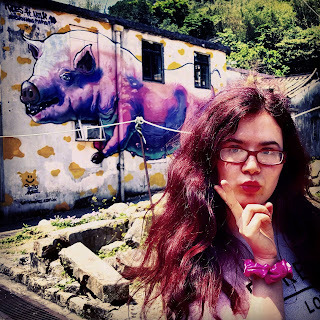 we took a trip to the gorgeous Lamma Island, now one of my favourite places ever. It's not overly big, considering it took us about an hour and a half to walk from one side to the other and back to where we began, but honestly, it was so beautiful and a great trip. I loved looking at the water, the little houses and the boats, and all the shrines dotted around the island. I also loved seeing all the people at the beach the Island has, as well as the little stalls and shops dotted around selling frozen pineapple. 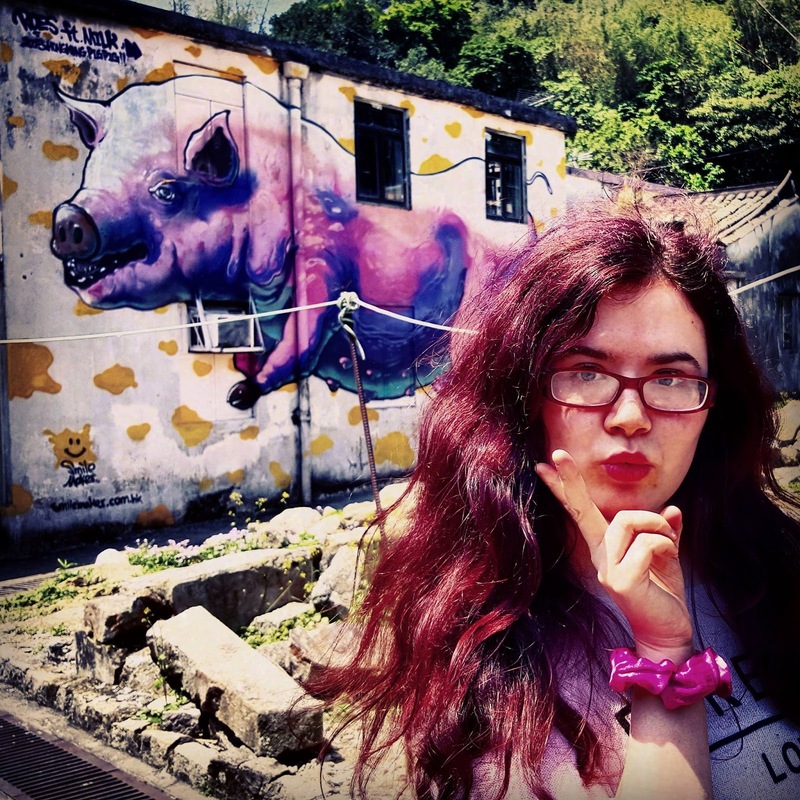 In all seriousness though, the mural was cool, and Lamma Island was just absolutely breath taking and so peaceful. By far my favourite place from the trip to Hong Kong! Hong Kong was such a great trip, and I want to go back again whenever I can to explore even more! Ten days was enough, it honestly was, but I want to discover more about the country and the beauty it holds. I want to do more,.. buy more... and explore a little more too, because it's fun, and it's extremely fulfilling and wonderful. A lucky Chiima is you.